All options for interim marks have been removed. This includes the academic history, student courses, gradebook, program and transcripts. Interim mark was the mark / cumulative avg for a student using only grades that have been entered. However there was a lot of confusion around this and we decided that to simplify the application by removing it altogether. The application will now calculate only the current mark which means that only grades which have been entered will be used in calculations for marks and averages. ampEducator is used by different types institutions which all employ different grading systems and so it provides users with the ability to chose how course , academic year, term, program and overall averages are calculated. Over the last several months we've had several institutions report inconsistencies with the cumulative grade point averages for students. After spending a week or two we discovered what the issue was. There was no bug but an assumption we were making about how averages should be calculated was the culprit. The problem only affected schools using the GPA (0-4) scale as a final course mark type. It has now been resolved. In order to make cumulative averages more consistent across all the different types of grading scales we've added this option to let you decide when it's appropriate to apply the grading scale. In most cases in makes sense to apply the grading scale. For example if you've defined the grading scale so that 70-79% is 3.5 GPA then here is how ampEducator will calculate the student marks. In the first scenario it will look up the appropriate GPA in the grading scale you've defined. In the second scenario it will calculate the GPA directly from the percentage (i.e. 0.75 * 4.00). In most cases it will make sense to apply the grading scale. The only situation where you probably don't want to apply it would be when the final mark for the course is also Percentage. 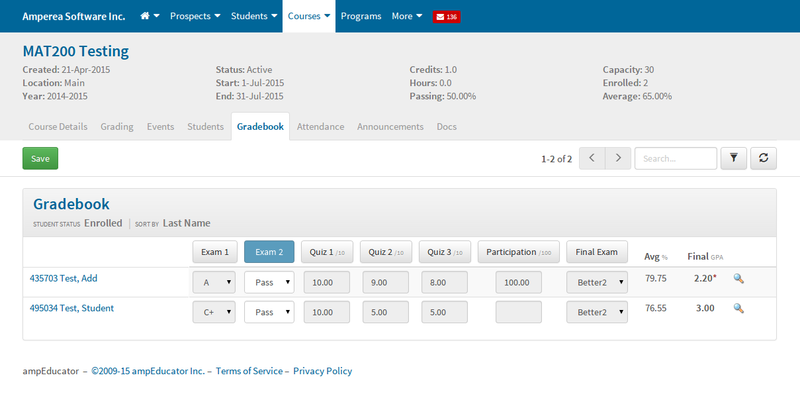 The gradebook and the detailed student grade pages have been update slightly to bring them up to date with the rest of the user interface. The 'Edit' links have been replaced with buttons and the look of the form elements has also been updated. 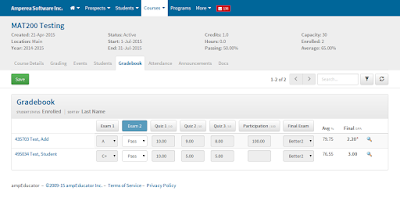 The course student list and and gradebook now display an 'Avg %' column in addition to the 'Final' column. The average column is the average mark of the student in percentage before any grading scale is applied. It is this percentage which is used to determine the final gpa / letter grade / pass fail / custom grade for the student. Pending' student enrollment has been removed. No institution was making use of it so we decided to simplify the application by removing it. You can no longer choose 'Grade Point' as a grade type. Please contact us at support@ampeducator.com if you have any questions, comments or concerns.